Australia completely outplayed England, to win by an innings and 41 runs in the third test of the 2017 Ashes in Perth on Monday. They now have an unassailable series lead of 3-0. 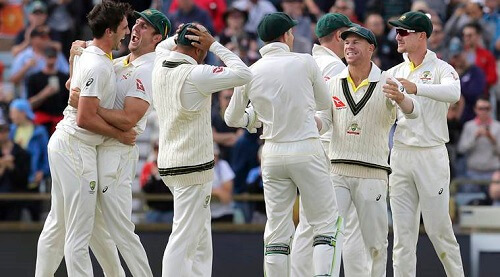 Australia started the day off needing six wickets for victory, while the touring side would have been hoping for more adverse weather to force a draw. There was a brief stoppage in play in the morning due to rain. However, England was in trouble as soon as play resumed. Chris Woakes was the final wicket, caught behind off a Pat Cummins delivery, which sparked wild celebrations across the famous WACA as Australia regained the Ashes urn. Josh Hazelwood finished as the pick of the bowlers with five wickets, as the tourists tail was powerless yet again to stop the Aussie bowler’s pace attack. The WACA pitch came in for a bit of criticism over the five days, and the day five pitch did indeed look poor with numerous cracks on offer for the bowlers to exploit. The start of play had been delayed by a good three hours, prompting hope that the visiting English might hold on for a draw. It took just one delivery for Hazelwood to exploit the cracks on the day five WACA pitch and kickstart Australia’s charge to victory. Johnny Bairstow was bowled by Hazelwood off his first delivery of the morning. The ball skidded off a crack and crashed into the off stump, leaving England with five wickets and praying for more rain.